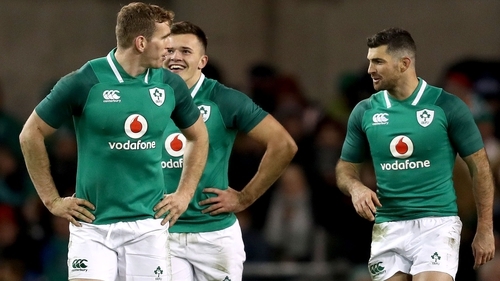 Rob Kearney and Sean O'Brien are among five personnel switches for Ireland as Joe Schmidt has changed a third of his team for Saturday's Guinness Six Nations clash against Scotland. As expected, Leinster full-back Kearney returns to the 15 jersey, with Robbie Henshaw, who has suffered a dead leg, ruled out. Chris Farrell replaces the injured Garry Ringrose at outside centre. "Robbie is unavailable," confirmed Schmidt. "He got a dead leg and it hasn't recovered sufficiently. "It was a bit of aggravation after taking a knock against England. The problem is, maybe he could have played, but if you get another bump, it really debilitates you. "It's exciting to give Chris Farrell the chance against Scotland. He only got one match last year and has come back into form with Munster." "Once Garry Ringrose was ruled out, it was about keeping continuity as best we can, to be as cohesive as we can be," added Schmidt in relation to the returning Kearney. The injury to Henshaw means the Ireland head coach did not have to make a decision on the Leinster man's continued inclusion at full-back following last week's defeat to England. Munster's Farrell, man of the match in his last Six Nations outing against Wales in 2018, is the latest man to partner Aki in midfield. "You've got Chris Farrell sitting in the wings, massively motivated to do his best," said Schmidt. "So it's a great opportunity to get him in and give him a run. Keith Earls has won his fitness battle and resumes on the wing along with Jacob Stockdale, while Johnny Sexton and Conor Murray continue at half-back. Schmidt has made three changes in the pack. Quinn Roux comes into the second row to partner James Ryan in place of the injured Devin Toner, while Sean O'Brien and Jack Conan are introduced into the back row, with Conan taking the injured CJ Stander's spot at the base of the pack. "Quinn will share the line-out calling with Pete," confirmed Schmidt. "I have no qualms about him being able to call the line-out. The front row of Cian Healy, Rory Best and Tadhg Furlong is unchanged, while Roux has fended off competition from Ultan Dillane for the second row spot vacated by Toner, who misses out with an ankle injury. His Connacht team-mate is named among the replacements. Josh van der Flier drops to the replacements bench to accommodate the returning O'Brien, who got 15 minutes off the bench last weekend. And looking ahead to Saturday's opponents, Schmidt believes that his side face a tough task against a Scotland side that will be buoyed followed their opening day victory over Italy. "We are expecting them to be very tough to beat. They play at a very high tempo with fast rucks. "I see Sean Maitland has been called back in. It gives them strength in depth, he is a super athlete. "The back three pose real threats across the board." Ireland team v Scotland: R Kearney; K Earls, C Farrell, B Aki, J Stockdale; J Sexton, C Murray; C Healy, R Best (capt), T Furlong; Q Roux, J Ryan; P O'Mahony, S O’Brien, J Conan. Replacements: S Cronin, D Kilcoyne, A Porter, U Dillane, J Van der Flier, J Cooney, J Carbery, J Larmour. Follow Scotland v Ireland (2.15pm) via our live blog on RTÉ.ie/sport and the News Now app, or listen to live national radio commentary on RTÉ Radio 1's Saturday Sport.